Collectively, the Hackaday readers sigh, “Not another Pi Zero hub!!!”. But [Sean Hodgins’] hub is different. It has a new angle, literally. Besides, it’s an entry in the Hackaday and Adafruit Pi Zero Contest . [Sean Hodgins’] acute approach is orthogonal to most of the other hubs we’ve seen. He’s mating the hub at right angles to the Zero. The hub plugs into both the on-the-go USB port and the USB power port. No extra cables or wiring needed. [Sean] plans to release the design on GitHub after his Kickstarter campaign ends. He’s supplying bare boards for those who like the smell of solder paste. This project nicely triangulates the issues of adding a hub to the Zero. The physical connection is solid with the boards connecting via the USB connectors. Power is supplied through the hub the way the Pi expects, which means all the protections the Pi Foundation built into the onboard conditioning are left in place. This also reduces surge problems that might occur when back powering through a hub and hot swapping USB devices. Another neat feature is the notched corner leaving the HDMI port accessible. Similarly, the Pi’s GPIO pins are free of encumbrance. One drawback is the hub is fused at 2 amps, just like the Pi. It would be nice to have a little more headroom for power hungry USB devices. Maybe another 0.5 amp to allow for the Zero’s usage. [Sean] snaps the two together after the break. It may be better designed than most, but… it’s still just a USB-hub. A good design is of course important and all that, but it’s just hard to get excited about a USB-hub. This is without a doubt the worst design yet. It is depending on the USB ports for mounting and takes up a ridiculous amount of space. I wish to god that somebody just made a small SBC with USB ports on-board that was actually available for purchase. Like the B+ that has Ethernet too? That is in stock everywhere. Have you checked lately? The last time I looked, the B+ was wasn’t available from any of the the official sellers – Farnell lists it as a “special order only” item (minimum order quantity 5000 units), RS lists it as out of stock with a dispatch date in June, and Allied say they don’t have any either. I figured this pi zero would be good for something embedded where you just need GPIO, but people seems to think its better as a full computer. This begs the question of why people don’t just get one of the other pies with a built-in hub. I could understand why you would wan’t to do this if usb hubs were expensive, but they really aren’t, and no matter how succinctly you do the design, it seems to me that it will always be less elegant than one of those pies with the integrated hub. It’s because they want a $35 computer for $5. There are many derogatory terms for people like this. I think that the Raspberry PI team have marketed this wrong or maybe it’s just being reported wrong. $4 USB device that runs Linux. HDMI port 1080p60 video output + Audio. *composite video option. GPIO port broken out to 0.1 header. Micro-SD card slot for OS and data storage. *note: The USB port can also be configured as a host via a MicroUSB to USB adapter. $4 USB Audio device that runs Linux. $4 USB Human Interface Device that runs Linux. Most of those require additional hardware and can be done better by dedicated devices that’re cheaper, smaller and more convenient than the Pi. Do you really want your USB-to-serial interface to run Linux and require a dedicated power supply, or to be damaged if you connect it to a 5V device like an Arduino? if nothing else it makes setting up/programming/debugging the pi before transferring it to the embedded function easier/more convenient. I would certainly prefer this to a traditional hub if I was dealing with a pi zero, but that’s might just be because I hate wires with a firey passion. that said, it’s a well down design on a site that has in the past featured various flamethrowers and at least a dozen builds of the most useless device in the world, so i don’t see why real world usefulness would enter into this even if this hub wasn’t useful. All respect to Sean and his thoughtfulness in his design, but surely somebody has done something else with a Zero. It’s nice to see people build interesting things. The hub seems to be reasonably well-made. However, this particular entry annoys me. There’s no information out there that’s actually interesting. What influenced the component decisions, what were the design problems, how did the creator go about the design process? Just … nothing. The BOM is a joke, giving way too few details about the components. And then there’s the promise of making it open-source as soon as the kickstarter has finished, which is really lame. What’s the point? You cobbled together a USB hub chip and some other components on a very mediocre PCB (power supply decoupling seems to be somewhat minimalistic, but it could still be okay … who knows? Also, no ESD protection! No idea if the USB traces are properly length-matched) and it’s secret enough to not warrant making it OSHW before selling it and entering it into contests? Granted, it’s a nice idea, and the execution is probably okay as well. But it’s this attitude of monetizing everything that puts me off so much. Do you know what people need to clone your project? They need a description: “USB hub that plugs into the raspberry pi zero with right-angle headers.” Everything else is completely obvious. Get a USB hub chip and implement its recommended circuit. Done! In my opinion, these contests would benefit greatly from a OSHW-only rule. Then, people could actually learn something from these projects. There are a lot of interesting techniques to be gained from looking at how people design electronics, even if they’re just hobbyists. You’re totally depriving people of this chance if you don’t open all your hardware design documents. How about a tutorial based contest next? Would you enter and show us how it’s done? Unfortunately, I have very little time. Contests require a bit of time, so unless the contest was fairly long-running and still minimalistic, I doubt I’d see any point in entering. However–! I’d totally enter. There are a lot of tutorials you can do without investing massive amounts of non-consecutive time. They’re probably far less fun than something that takes you from design to implementation, but they can still be interesting. However, time is a real problem for me. I can design a small circuit and do a PCB layout in a day or so, but getting the PCB and components will take weeks (or cost ungodly amounts of money and lots of wasted time with customs), after which I might be completely immersed in some non-hobby project. It’s not unknown to me to have a PCB made and still not have it populated half a year later. Hardly a good start for doing a very elaborate tutorial, I’m afraid. For single steps in the design process, however, I’d be quite happy to write up something and enter it in a contest. These contests would provide an extremely good opportunity to see actual development. If you open some electronic doodad that’s already made, you can see how it’s built. However, you can only guess why it was built that way. There’s a clear lack of documented projects on the internet. Some high-profile bloggers seem to find it worthwile to start something and then stop somewhere in the middle of the project, with the project never to be heard of again. Which is a shame, but I guess it’s just easier to alternate between opening letters and devices. The nicest project documentation usually comes from “true” hackers, but their design process is usually very iterative and uses components that happened to be available. What we’re clearly missing are well-documented projects that focus on documenting progress instead of documenting the outcome. You can learn a lot from looking at schematics and PCB layouts, but you can learn so much more if you can follow the design process, get to know the design decisions and see if you’d have made the same decisions. Just because the link isn’t in your face, doesn’t mean its not open hardware. I didn’t want to advertise the github beacuse its not in its final state and I’m making modifications here and there. Such as those mentioned. And yeah I get its a github so people can see the changes, but I generally don’t take good care of the repo until I know the project is going to work out. Its a mess and I don’t want people thinking they can just download and go. Its OSHW as you see always has been. p.s. The USB are not differential pares yet, I’m changing that now, but initially didn’t bother because with USB 2.0 high speed you can have somewhere between 10-15mm in length difference on a top layer trace and it will still work. Wanted to get a prototype and test out how securely it connects to the Pi and I’m satisfied with the strength of the connection. There aren’t a lot of board connectors for USB Micro, the horizontal ones are horrible and not strong, so I went with vertical and they proved worthy. People are able to do what they want and make their own(and they are encouraged to!) but there are people who just want something simple and not have to build it. The hackaday writer seems to have been slightly misinformed about the availability of source files, but it’s hard to assign blame to him here–there is no link on the project page and no link on the Kickstarter. The Kickstarter explicitly states that design files will be released after the Kickstarter campaign. With Kickstarter projects, I just want to be sure to get something reasonable before putting in money. Promises of access to open-source design files in the future are completely worthless, unfortunately. This is from experience. – Decoupling capacitors for the voltage regulator seem to be missing. Or too far away. Or both. – Try to get rid of tantalum capacitors, they’re a pain for a multitude of reasons: Apart from very questionable practices in sourcing tantalum (which at least the good-quality manufacturers seem to have solved by ensuring that no conflict minerals are used for their capacitors), they are prone to catastrophic failure, expensive, and not suitable for fast transients, and need to be massively overrated to ensure proper operation. There are still uses for them, but for standard circuits, you might just be better off without. Try replacing them by multi-layer ceramic capacitors (MLCC), with an X5 or X7 dielectric. 25V should be enough. Capacitance of MLCCs is dependent on voltage. With tantalum capacitors, you overrate for safety. With MLCCs, you overrate to be able to actually use their capacitance. If 25V MLCCs are too expensive, 16V might also be okay. – You might want to add some basic ESD protection circuits. This is especially important with the USB sockets, as they might be very prone to ESD with all the plugging and unplugging of USB devices that is to be expected. There are specialized USB ESD protection ICs on the market. – Try marking the polarity of the external power supply plug on the PCB. I don’t even use (micro-) usb ports with only smd pads anymore in my designs. they will break. definitely if u use them for mechanical support like this. They’re quite strong and experiencing a lot less force than when you actually plug in a regular cable, which you do every time you power the Pi. There isn’t much strain on the ports. I have a lot of confidence in them. where is everyone getting their Pi Zeroes from..????? I cant find one for the life of me which does not come with all the unnecessary things. – where is everyone getting their Pi Zeroes from..????? They’re delivered by Duke Nukem Forever himself flying his personal retail jetpack. It seems now Valve will give one with every Half Life 3 game DVD. > “Not another Pi Zero hub!!! Indeed! And this one is even worse, because it is not even a Hack, but a plug for a Kickstarter campain. I see some merit in hacking some surplus USB hub to a $5 computer to make it more usable. It’s a hack after all and that’s ok. But maybe only interesting once. The design is nice, would leave space for a pHat dac from Pimoroni. Would allow for a neat case design. I was worried we wouldn’t see today’s entry into the Pi Zero USB hub club. Can we drop the articles on Pi Zero hubs and see some real Pi Zero projects? It’s seriously getting tedious and boring. Sure, just send links to your projects or projects you’ve found to the Hackaday tip line. Or make sure everybody finally gets one. As for now, we have what we have. In my opinion it’s the design fail. When you plug three usb cables in that hub SMD microUSBs will break, probably taking the traces with them an rendering zero crippled or even unusable. One issue that I see right off is that the hub ports are mounted on the top edge of their PCB. Whit the hub plugged into the Pi via 2 micro plugs, this is definitely something that would require mounting in an enclosure to avoid excess strain on ALL of the USB ports/plugs mounted to the boards. $5-15 shipping for $25 piece of crap add-on that looks like its going to snap the first time I look at it funny for a $5 product? sign me up! This makes me nervous due to the 90 degree angle. As soon as you plug a cable into it, it puts a lot of bending torque on the Pi’s USB ports. One wrong move, one slight tug, and your Pi is toast. How about one that lays flat with the board, doesn’t block the other ports, powers the Pi, and has an On Off so you don’t have to keep unplugging? I only see this either as a way to use the Pi Zero to develop an embedded application on where it isn’t connected when used in the project, or it becomes part of the project. In both cases, I don’t want something sticking up at 90 degrees torquing the connectors. 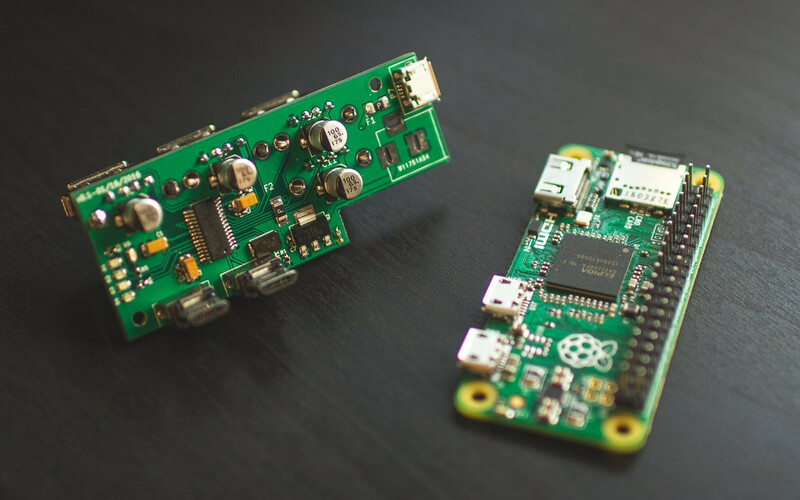 Is it true that there is a pi zero shortage because some people buy all devices and turn them into usb hubs? No, there is a shortage because they’re so cheap and people buy them all up… only to allow them to collect dust. Check Hubpixed – the USB Board is in parallel with the Pi Board and not at right angle to it. Makerspot has an even better USB hub that has 4 ports, current limiting, and can also have external power supplied. Same price as the Hubpixed.